The competitive response cycle is a process of researching your competition that you can use to continually make sure your food truck is meeting the needs of the customers you’re targeting (and, therefore, helping you increase your profits). You may have decided to enter the mobile food industry for various reasons. Maybe you have a desire to open a mobile dining facility that allows you to show off your culinary expertise, or maybe you want a platform that brings you the pleasure of serving your community with a new style of cuisine. You can accomplish those purposes with almost any job; so why are you going into business for yourself? Oliver Stone’s classic movie Wall Street introduced a business concept that many have frowned upon. The movie’s main character, Gordon Gekko, is often quoted from a long monologue in which he proclaimed that “greed is good.” This phrase has riled many into believing that wanting to make money for one’s self and one’s business is greedy and, thus, a bad thing. And although many business owners feel that measuring their business’s success is based on more than money, ultimately, the bottom line to whether their business is successful is solely based on their profitability. The ultimate goals of owning and running a food truck must be to create a product that can be sold and to make a profit while doing so. If you can’t get past this point, you’re doomed to failure. You may have the coolest designed food truck around, a great group of customers, and a trendy menu, but if you aren’t able to make a profit, you may as well save yourself the hassle and never leave your commercial kitchen’s parking lot. You also must recognize that making a profit isn’t merely going to happen as soon as you open your service window. You’re going to have to work hard to keep a competitive advantage that will assist in getting those profits rolling. Analyze consumers’ needs and wants. 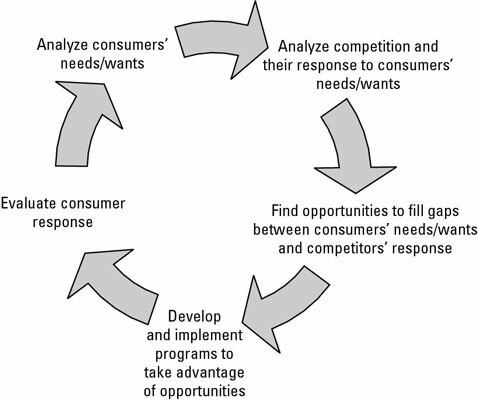 Analyze your competition and their response to consumers’ needs and wants. Find opportunities to fill gaps between consumers’ needs and wants and your competition’s response. Develop and implement programs to take advantage of opportunities. Evaluate consumers’ responses to your programs.